In many areas of the United States, ice melt is an absolute necessity during the winter months. It keeps sidewalks clear, ensures driveways and parking lots are clean and ice-free, and roads safe for driving. However, while ice melt is essential, not all types are safe for use around pets. Some are quite toxic when ingested, while others cause irritation to paws, skin, or mucous membranes after exposure. Here is everything pet owners in snowy areas need to know before taking their pets out into a winter wonderland. Are Pet-Safe Ice Melts Completely Safe? However, this doesn’t mean that pet owners shouldn’t know which ice melts are safest for their pets. They should be aware of the types of ice melt that are available, as well as what sort of impact they can have on their pet’s health. While some of the other ice melts out there are easier on dogs’ and cats’ paws than rock salt, they are much more dangerous when ingested. Ethylene glycol-based ice melts contain the same active ingredient as antifreeze, which is very deadly if ingested. “It’s one of the deadliest toxins we see at our office,” Inman notes. Some of the safest of ice melts are the ones with a propylene glycol base, Gorman says. However, it should be noted that propylene glycol ice melts often include urea as the active ingredient, which, while generally recognized as relatively pet-safe, is not as effective as other ice melt options, according to some chemical companies. And propylene glycol itself is not without some concerns. While it is quite safe for dogs, propylene glycol can damage a cat’s red blood cells when ingested. In rare cases, signs of generalized toxicity may develop after a pet ingests a large amount of ice melt. For example, the high blood sodium levels that can develop after ingestion of rock salt may result in neurologic symptoms like lethargy, weakness, unsteadiness, behavior changes, muscle twitches, seizures, and coma. While it is true that no ice melt is entirely pet-safe, owners can take steps to mitigate ice melt-related dangers. 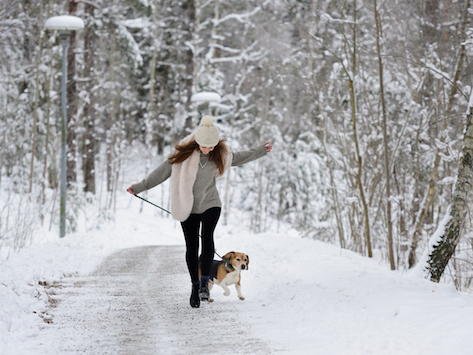 First, as mentioned before, if your dog goes on a walk through an area treated with ice-melt products, you should take a few minutes to wash your dog’s feet once you return home. In terms of ingestion, dogs should be prevented from eating ice melt when out on walks, and all chemicals should be kept locked up and out of reach of pets when not in use. If a pet does get into ice melt, our experts urge pet owners to call their veterinarian or the Pet Poison Helpline, and, if the pet has ingested a large amount, head straight to their vet or nearest animal hospital.